Why are offices boring? 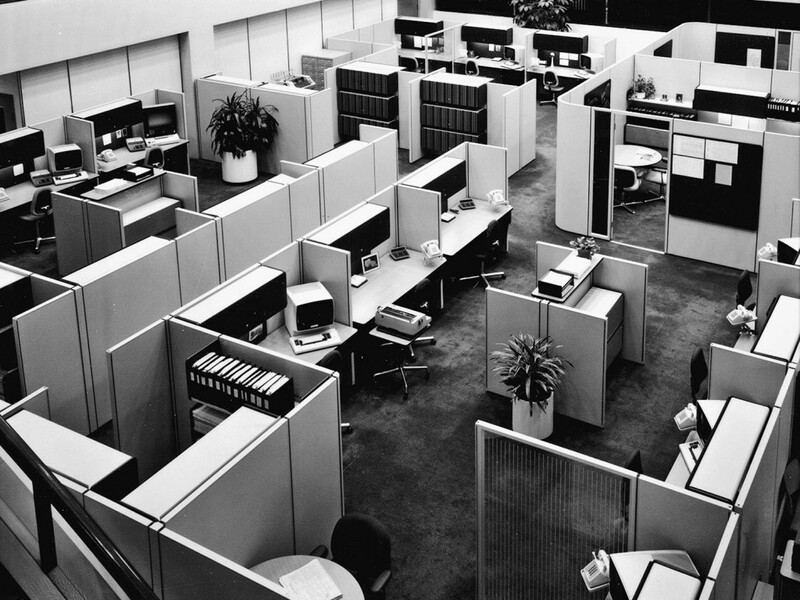 Why do we still embrace this cubiclife? This is a really interesting question. Why do offices look like the one in the picture above? Do these increase productivity? No, in fact, most research shows that offices that are comfortable increase flexibility (see research on sick building syndrome). So why do we still have these? Why are they still being built? Its a good question and I think the answer is that its what we know. Its easier, doesn’t take as much thought/planning, and it utilizes space well. However, we need to start to get away from this type of thinking and start focusing on making the place where a worker spends 40+ hours a week as comfortable as their home. And I don’t mean adding a plant, hanging a picture, or a slogan to an already boring cubiclife (what I call working in a cubicle). I mean adding couches, making the office colorful, making the office comfortable, and cater to various types of working styles. I see this trend in tech world but other industries still aren’t catching on. I see workers dressing business professional and sitting in a grey office cubicle all day and I can’t help but cringe. So come on companies, loosen up. Let workers work the way they live and see how much productivity increases. Hopefully you read my article on online privacy and why it’s important. This post will focus on finding the best free VPN. Before I start, I will just mention that if you really want a VPN, just buy one. For a less than $100 a year you can practically get any paid VPN. I actually pay $30 a year for mine, that’s a little over $2 a month. The advantage of a paid VPN is that its 10x faster than free ones. So to me I don’t notice a difference in speed now from my fast wifi now that I use a paid one. With the free ones, I did notice that difference. So its worth $30 a year to me. Having said that, if you are going to use a free VPN here are some things to pay attention to – Why is it free? Are they pushing ads? How do they make it free? From what I have found is that most VPNs offer a free version and put restrictions on them. For example, they only let you use 200mb of bandwidth a day or maybe 5GB per month – some kind of restriction like that. Honestly, those don’t work well for me. I watch a lot of youtube videos for work and that bandwidth was sometimes used in 20 minutes. So what is the best free VPN? I was able to find one that is 100% free, its a full VPN package meaning is prevents leaks and does its job. It also allows you to use unlimited data – something other free VPNs do not. Its called CyberGhost VPN. Now how do they make it free? Well they do have a paid version and their free version has a few restrictions. When you start it up, it takes anywhere from 3-5 to start (the paid version is instant), its somewhat slower (the paid version isn’t and all free ones are slower like this), and it shuts off every 3 hours (so you need to reset it). After a lot of testing I could get past the 3-5 minute start up time in order to have free unlimited data. It was a small price to pay. No other free VPN even comes close to this from what I could find. They all have a data limit except for CyberGhost. So if you are looking for a free VPN look no further. Obviously if you are looking at this article in 6+ months from now please do research as all of this information could of changed. Also note when buying a VPN, look for sales. They all have 30-50% off sales. For example, I have seen the one mentioned in this article for as little as $25 a year on sale. Online learning vs eLearning vs Distance Learning? We have multiple types of delivery formats available to us, however, many times we use words interchangeably and never think about what they really mean. This causes problems when talking to clients because what they envision as eLearning might be what you consider distance learning and all of a sudden your final product does not meet their needs. So its always best to define and describe during your proposal so that an operational definition can be established. In this post I will describe some of differences between all of these common terms so that you can more easily describe to clients what you are designing. eLearning – Self paced learning that is computer or mobile based. The module is completed without an instructor. A lot of people also refer to this as online learning and use the two words interchangeably. Distance learning – Again, this is another term that people use interchangeably with online and elearning. However, distance learning means learning that takes place at a distance without an instructor. There is no technology requirement but it can exist. In fact, the first distance education courses were developed in the 1800s. Virtual learning – Learning that takes place in a virtual environment, that is live, and uses video conference technology. Face to face learning – learning that happens real time in a classroom. As you can see, there are real differences between all of these but most clients wont know those differences so you need to be careful when discussing them to make sure that you and the client are on the same page. I am constantly bombarded with instructional strategies, design recommendations, and means to improve instruction. However, while that’s awesome and I love to see new innovative ways to teach, I have stumbled onto a question that we do not ask very often unless it’s in the context of K-12 standardized testing – how much does this improve learning? So when someone tells me that some constructivist approach, for example, problem-based learning (insert any strategy here) is a good strategy for the classroom I need to know how it impacts learning. Specifically, I want to know how it affects low-level learning, such as recall, and high-level learning such as problem-solving/transfer. How much does it affect achievement? I don’t want to just hear that it improves it over another method/strategy but I want to hear that it improves it by X% amount. Because if that improvement is only 5%, it might not be worth changing an entire curriculum. If we start to think this way we can start to make better decisions about what works and doesn’t work in the classroom. This will save us both time and money because we won’t waste significant amounts of time on changes that offer little to no improvement in achievement. Of course, we need to consider other variables like motivation and such, which could very well be more important than achievement in various settings but that is going to be case dependent. And regardless, we still need to have improvement numbers to ensure there is going to be a return on investment. If we could agree that this is an important piece of data to have we could start to figure out what these numbers are. This involves experimental testing using GOOD methodologies, GOOD content, and GOOD tests; otherwise, we cannot trust that research.